Elon Musk is serious about adding yet another crazy techno-biz idea to his collection, which already includes no way that can work ventures like PayPal, Tesla Motors and SpaceX. Originally pitched as a way to get from San Francisco to Los Angeles, his Hyperloop transportation system will get its first test run in the desert north of Las Vegas. Hyperloop Technologies has secured $37m (£26m) in funding. But the initial proposed track from Los Angeles to San Francisco has been estimated at costing $8bn (£5.6bn). And it will need a lot of buy-in from any government that fancies a Hyperloop in its country. “The regulatory side is a key part,” one of the cofounders tells me later. Shervin Pishevar is no stranger to ripping up the transport rulebook. Except that labor interests – unions and their amen corner in Sacramento – are still trying to shut down Uber. Survival of its current business model is by no means a sure thing. And that’s child’s play compared to the permits and environmental review required to build an elevated tube between San Francisco and LA. So it’s no surprise that initial development is happening in Nevada, and Hyperloop is looking far and wide for a place to build its first full scale prototype system. Don’t bet that’ll be in California. Musk is crazy, not stupid. What’s the crazier idea? Inventing a pod that will carry people hundreds of miles through airless tubes at supersonic speeds, or thinking that hundreds of miles of anything can be built in California in the span of, say, a human lifetime? Even Elon Musk, who unveiled his plans for the former last year, might find the latter beyond his reach, let alone his grasp. Musk has a team of volunteer engineers working on the technology, and by all accounts they haven’t hit a show stopper. Although, to be fair, one of the things they haven’t come to yet is the question of exactly how many billions of dollars are needed to build Musk’s notional prototype Hyperloop line between San Francisco and Los Angeles. His envisioned route would slice down the Interstate 5 median strip. Yep, all he needs is a hand wave from Caltrans. Yep, the same people who spent 25 years rebuilding half of the Bay Bridge, and who roll up into a fetal position at the mere suggestion that installing tiny plastic tubes — conduit — along highways is a good use of their domain. And of course, no one could possibly object on environmental or neighborhood serenity grounds. Anyone with a Silicon Valley pedigree and a major manufacturing plant across the Bay in Fremont – like, oh I don’t know, maybe Musk? – knows that the Silicon Valley BART extension approved by voters in 2000 might – might – make it to south Fremont next year, and won’t make it to Santa Clara before 2025, if then. Compare that eternal 16 mile build to the 72 miles of original BART track built between voter approval in 1962 and start of service ten years later. 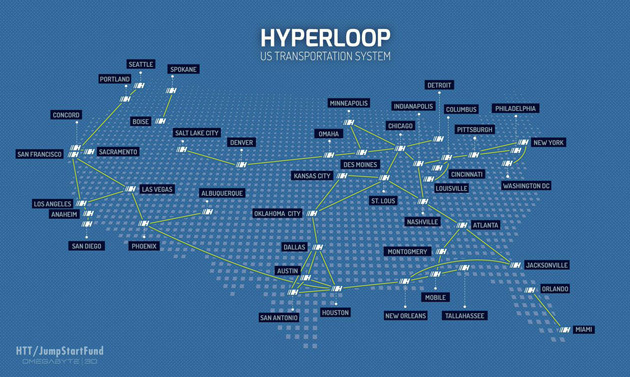 So it’s no surprise that the Hyperloop team has sketched out an eventual U.S.-wide network, and Musk has said that the first test track will be built in Texas. If nothing else, the company has floated a shopping list of potential proof of concept routes. Check it out. How about Las Vegas to Phoenix? Or Orlando to Miami? Not to mention the Dallas – Houston – San Antonio triangle, with a stop in uber-cool Austin. Great ideas begin in California. Implementation, and the jobs and service benefits that go with it, increasingly end elsewhere. We have to welcome both.